On July 28, 1945, a B-25 bomber plane crashed into the world’s tallest building, killing 14 people. But it wasn’t an act of war or terrorism. It was simply an accident, the terrible result of a confused pilot flying into New York City on a foggy day. At the time, the Empire State Building was a mere 14 years old. In fact, skyscrapers were a relatively new concept, so not only was it the tallest building in New York, it was also the tallest edifice in the entire world. And while that usually made the Empire State Building visible from nearly anywhere in the city, July 28 was a particularly foggy day. That morning, the air traffic controller at LaGuardia airport had mused that he couldn’t see the top of the building. Around 9:50 a.m., Col. William F. Smith, Jr., found it. A decorated pilot who had received the Air Medal, the Distinguished Flying Cross, and the Croix de Guerre, Smith was not a novice airman. He had originally planned to fly into LaGuardia Airport, but made a last minute decision to land at the Newark Liberty International Airport instead. Disoriented by the fog, the pilot apparently thought he was on the final approach into New Jersey. “Had he kicked left rudder when he passed the Chrysler Building, he'd have been home free. But he started to go right rudder, and that put him in the path of the Empire State Building,” Arthur Weingarten, who researched the incident for his book The Sky Is Falling, told The New York Times. By the time Smith realized where he was, it was too late. The plane smashed into the 78th and 79th floors at about 200 mph, spraying jet fuel and igniting several floors of the building. One of the plane's engine's flew through the building entirely, landing in the penthouse of a nearby apartment. Smith and both of his passengers perished, in addition to 11 people who had been diligently working just minutes before. Fatalities could have been much worse—it was a Saturday, so many workers on those floors were at home. In the end, it took more than $1 million ($10.5 million today) and three months to repair the damages—and many years for some New Yorkers to recover. 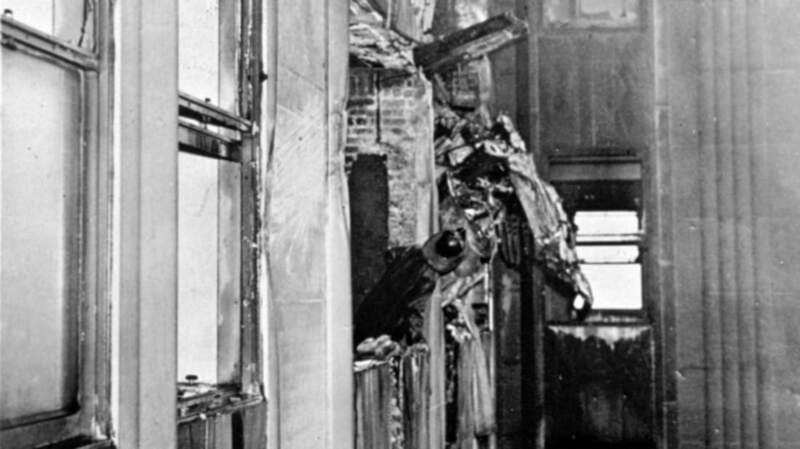 As one survivor who working in the building that day, Therese Fortier Willig, told The New York Times, "Time is a wonderful—I don't know whether you can call it a healer, but it makes you forget."